Good water quality is the key to a healthy, beautiful aquarium. Tap water contains chemicals, such as chlorine and chloramines, which make water safe for drinking, are highly toxic to fish. High levels of these chemicals destroy fish gill tissue, preventing the uptake of oxygen which can lead to fish death. Even low levels irritate delicate fish tissue. Tap water must be treated before adding fish to make sure fish remain healthy. 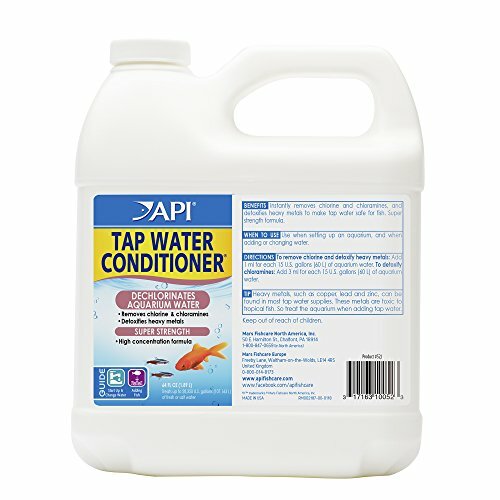 API TAP WATER CONDITIONER Aquarium Water Conditioner instantly removes chlorine and neutralizes chloramines. It also detoxifies heavy metals in tap water. The formula of API TAP WATER CONDITIONER incredibly concentrated. You only need up to 3 ml to treat 10 gallons of water. It's safe for all aquatic and can be used in both fresh and salt water. Use during aquarium set up, water changes and adding fish. With API Aquarium products, it’s easy to keep a beautiful saltwater, freshwater or reef aquarium. For over 50 years, API has been creating innovative, research-driven solutions that make it easier to care for your fish and aquarium. API Aquarium Treatment Supplies are designed to work in conjunction with each other to provide best results to control algae, promote healthy bacterial growth and help control and cure fish diseases and conditions such as ich and fin rot. They work to provide a safe, hospitable environment for fish such as tropical community fish, cichlids, goldfish and more. With API, you can spend more time admiring your fish, and less time scrubbing your tank. Make sure to use all products as directed in order to ensure the best results. View More In Aquarium Water Treatments. AMMOSORB Natural Aquarium Ammonia Eliminator Deco Rocks: 2 lb.